Serving an all-day brunch and lunch with an alfresco patio, Malo is Silver Lake's answer to a South of the Border stay-cation. Start with a margarita—we like the hot sauce-laced Spicy Cucumber ($12)—and guacamole with addictive half-fried, chewy tortilla chips (you might need to request them). Then, sink into Mexico's answer to the hamburger—the house signature taco is filled with ground beef and pickles—and other updated classics like vegan menudo and bolillo-battered Mexican French toast. Not the hole in the wall taco spot that some folks might want in the area, but a place that I think is excellent and has a great elevated vibe while still being comfortable and welcoming. My only complaint is that this place is on the pricey side, but beyond that I'm a big fan. The patio area is a nice place to sit and pretty much everything I've had is delicious. They have wide range of interesting crafted tacos ranging from the usuals to pickles & beef and things with poached eggs. I haven't been disappointed by any that I've tried, even the chips and guac were great. I also remember having a great cocktail last time I was here called the pinata or something of the sort - fruity and refreshing and very tasty. 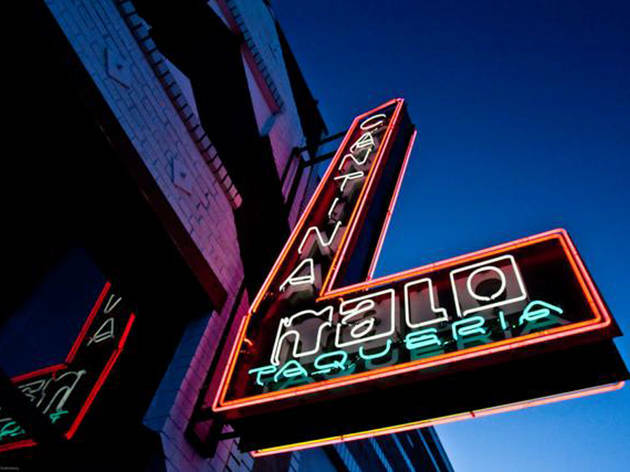 Malo is a good spot for a meal with friends for sure.